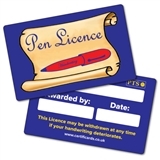 These high quality 'Pen Licence' CertifiCARDS are a superb way to reward your pupils for excellent handwriting skills. 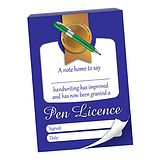 Each card has space to add the pupil's name, your name and the date, and has a sentence on the reverse which reads 'This licence may be withdrawn at any time if your handwriting deteriorates'. 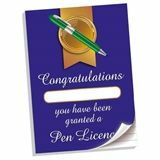 The new wood pulp CertifiCARDS still have the high-quality that you expect from PTS products, but are much more environmentally friendly.